At WILDER we believe our dogs live a longer, healthier and more active life when they are fed the meat rich natural diet they evolved to eat. Our thoughtfully prepared snacks are crafted to be as delicious as they are healthy and we make sure to source only the finest natural ingredients to create a nutritious snack packed with essential vitamins and minerals. Our treats also contain absolutely no artificial preservatives, grains or gluten, and is made with the same quality ingredients and care that you want for your own food. After all our dogs are family and they deserve to be treated like family. What makes WILDER so good for your dog ? 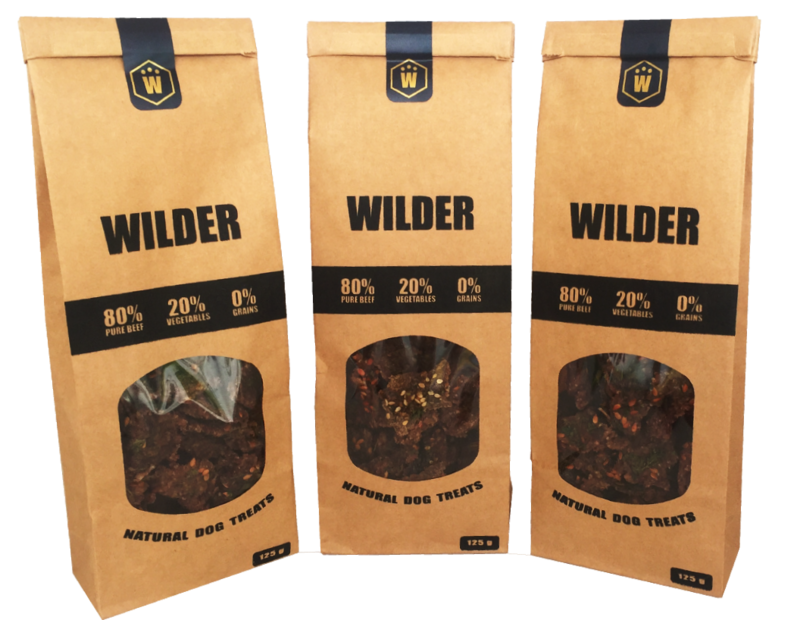 With a minimum of 80 % meat, Wilder is a healthy high protein snack that not only aids in the development of lean muscle, but also provides sustained energy for your dog throughout the day. 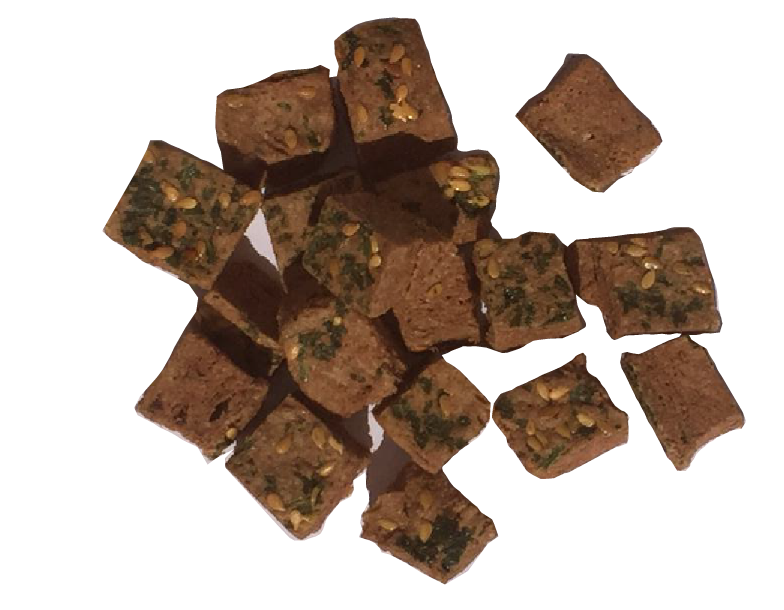 Our treats are made with fresh vegetables, herbs and seeds containing natural enzymes, probiotics, anti-oxidants, vitamin and minerals providing your dog with healthy carbohydrates and dietary fiber. That is why we ensure our treats have 0% grain in them. Our treats are made with fresh vegetables, herbs and seeds containing all natural enzymes, probiotics, anti-oxidants, vitamins & minerals, providing your dog with healthy carbohydrates and dietary fiber. We only use the finest locally sourced human grade ingredients, giving you peace of mind that all our ingredients are fit for human consumption. The source of protein is a critical part in the bio-availability of essential amino acids for your dog. That is why we source only the highest quality meat cuts for our treats. Our treats contain absolutely no artificial preservatives, colourants or flavourings of any kind. All our ingredients are natural and gently dehydrated to preserve the food from spoiling. Our treats contain absolutely no artificial preservatives, colourants or flavourings of any kind. All our ingredients are natural and gently dehydrated to preserve the food from spoiling. The source of protein is a critical part in the bio-availability of essential amino acids for your dog. That is why we source only the highest quality meat cuts for our treats. Preserving food by dehydration is one of the oldest and most efficient methods of preserving food. It is a technique of gently removing the moisture from food while retaining all the enzymes, antioxidants, nutrients and vitamins. We have created a healthy and nutritious snack by slowly dehydrating our meat and vegetables between 75°C and 80°C, removing harmful pathogens whilst retaining the great aroma and flavour of fresh raw food. Heat is the enemy of nutrition and preparation of food under high heat results in significant loss of nutrients and vitamins. By gently dehydrating our food at a low temperature we ensure the antioxidants in our meat, herbs and vegetables will be far more likely to be intact and digestible than baked or canned goods, which are processed at high temperatures. This is also true for the natural enzymes, probiotics, amino acids, vitamins and minerals in your pet's food. Dehydrated food offers all the nutritional benefits of raw food, without the risks of bacterial pathogens or diseases. Our canine companions have always been natural hunters, if you look at their ancestry you will find that your dog's digestive system is essentially the same as a wolf despite thousands of years of domestication. Dogs and wolves are 99.8% genetically identical with a large acidic stomach and a short intestinal tract, fit for the consumption and digestion of meat. No greater evidence of their carnivorous nature can be seen in a dog's teeth and jaw structure. Dogs have no flat grinding teeth used for eating grains, they only have sharp teeth used for holding and tearing meat and grinding bones. Exactly why our snacks are based on your dog's ancestral diet, which is high in animal protein with added vegetables and herbs for extra nutrients and fibre, making it not only healthy but delicious as well. Beef is an incredible nutrient-packed protein with high levels of Vitamin B complex for increased energy throughout the day, Phosphorus for developing a strong skeletal system, Zinc to support a healthy immune system, and Iron which helps to prevent and reduce fatigue. Beef also contains high levels of Selenium which is known for its treatment of allergies, arthritis, and heart disease. Sweet potatoes are a low fat complex carbohydrate and a natural energy source rich in vitamins and minerals such as Magnesium, Potassium and Manganese. They are also a great source of Vitamin C, which helps fight infections and heal wounds, as well contain high levels of Beta Carotene, which helps to prevent disease and infection. Sweet Potatoes are one of the best dietary source of Vitamin A, which promotes healthy skin, coat, eyes, nerves, and muscles in dogs, as well a rich source of Vitamins B6, Calcium, and Iron. Most of the fats in coconuts are medium-chain triglycerides , which are healthy saturated fats that aid your dog's metabolism. Coconut also contains valuable lauric acid which has antibacterial, antiviral, and anti-fungal properties that assist in destroying bacteria which may cause stomach ulcers, dental cavities, and urinary tract infections. Rooibos is rich in vitamin C, and boasts two flavonoids called quercetin and luteolin, which have cancer-fighting properties and can help with any inflammation. Rooibos has been shown to help with allergies and hot spots, digestive issues and even stress in dogs as well as people. Parsley contains high levels of Vitamin K, which crucial in assisting calcium to strengthen dog’s bones and teeth, as well as decent amounts of Vitamin C, a natural antioxidant. Parsley also contain limonene, a natural oil that kills bad mouth bacteria leaving your dog with healthy gums and a fresh smelling breath. Rosemary is a one of nature's best antioxidants, which strengthens blood capillaries and protects your dog against free radical damage that can cause certain types of cancer. Rosemary is also a rich source for Vitamin A, Vitamin C, Folate, Calcium and Potassium. Chia seeds are able to slow down the conversion of carbohydrates into sugars, creating stable blood sugar levels, which in turn contributes to naturally high levels of energy for your dog. The added benefit of slowing down digestion, is it enables full absorption of nutrients while dogs feel satiated longer. Chia seeds are another great source of Calcium and Magnesium, crucial for the development and maintenance of healthy bones, and Iron which plays a vital role in the formation of haemoglobin, the molecule that carries oxygen in red blood cells. Anise is rich in B-Complex Vitamins, Vitamin A & C, and important minerals such as copper, iron, magnesium, manganese, zinc and potassium. Flaxseeds are a great source of Omega-3 and Omega-6 fatty acids, which are great for your dog's skin, coat and heart. Flaxseeds contain Alpha linolenic acid, which can greatly assist dogs suffering from canine arthritis and minor joint problems.